Why are we here? This is an age-old philosophical question. However, physicists like Will Cairncross, Dan Gresh and their advisors Eric Cornell and Jun Ye actually want to figure out out why people like us exist at all. If there had been the same amount of matter and antimatter created in the Big Bang, the future of stars, galaxies, our Solar System, and life would have disappeared in a flash of light as matter and antimatter recombined. But we know that’s not what happened. After matter-antimatter recombination, sufficient matter remained to form galaxies, stars, planets, and physicists who wonder why on Earth things turned out the way they did. The JILA team thinks precision measurement of the shape of the electron may help them figure out the answer. They think that in the beginning of the Universe, there must have been a slight excess of matter vs antimatter caused by tiny asymmetries in fundamental particles such as the electron. If, for example, the electron is ever-so-slightly egg-shaped (rather than round), then it may help explain why the scientists doing the experiment and the rest of the material Universe exist. The challenge faced by the Cornell and Ye group is that an asymmetry in the electron’s shape––called an electron electric dipole moment, or eEDM––would be vanishingly small. If an atomic nucleus were the size of our Solar System, then the eEDM (if there were one) would measure only a few millimeters. The actual eEDM (if there is one) might end up being measured in nonillionths or even decillionths of a centimeter (10-30––10-33 cm). These are breathtakingly short distances that require sophisticated physics experiments to precisely measure. Determining the length of something this tiny not only requires creative experimental design, but also a profound understanding and application of precision measurement techniques. Fortunately, precision measurement of ultrasmall things is a specialty of the Cornell and Ye groups. The team recently used its sophisticated trapped-ion, rotating electric-field apparatus in its latest series of precision eEDM measurements. The Cornell-Ye collaboration determined an upper limit for the eEDM of 1.3 x 10-28 e cm, which is consistent with the upper limit of 9.3 x 10-29 e cm found in a different experiment by the ACME collaboration between Harvard and Yale in 2014. In other words, even at such tiny distances as 10-28–10-29 cm, the electron is still round. One very cool thing about this experiment is that the JILA team is positive its measurements were free of any bias on the part of the experimenters. The researchers did a year’s worth of experiments in different experimental configurations, all the while measuring the eEDM blind. Instead of having their computer tell them the results of individual measurements, they programmed the computer to add a random number to the results, so what the researchers saw after each measurement was a meaningless number. They did their experiments like this to keep their personal expectations, or bias, out of the results. Then after a year, they asked the computer for the answer. 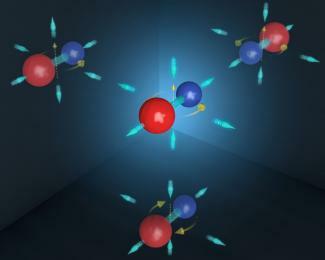 The answer was consistent with zero, meaning that at the level they could resolve, the electron was still round. However, Cairncross, Gresh, and their team aren’t about to give up. They’re building a new experiment expected to resolve length measurements of 10-30 cm, tantilizingly close to where the researchers expect to see evidence of an eEDM, if it exists.